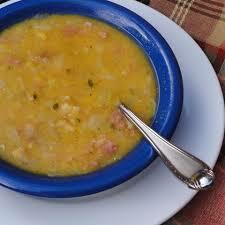 Make yellow pea soup, the traditional Swedish Thursday supper! Clean peas and soak overnight. Cook in same water, covered, bringing quickly to boiling point. Remove shells floating on top and add pork and desired seasoning. Cover and let simmer slowly until pork and peas are tender (1-1 ½ hours). Remove pork, cut in slices and serve separately with mustard.